The Atomium is a building in Brussels originally constructed for Expo 58, the 1958 Brussels World Fair. It stands 102 m (335 ft) tall. Its nine 18 m (59 ft) diameter stainless steel clad spheres are connected so that the whole forms the shape of a unit cell of an iron crystal magnified 165 billion times. The Atomium copyright history is pretty absurd and surrealistic, hence typical Belgian. Currently the royalties are perceived by the descendants of André Waterkeyn, the engineer who conceived Atomium in 1955, and not by the A.S.B.L Atomium. This is the case where photographs are taken by private individuals and shown on private websites for no commercial purpose (the current trend for photo albums). In accordance with legislation, usage rights for the image of the Atomium would naturally extend to 1st January 2076, in other words, the seventieth anniversary of André Waterkeyn’s death. 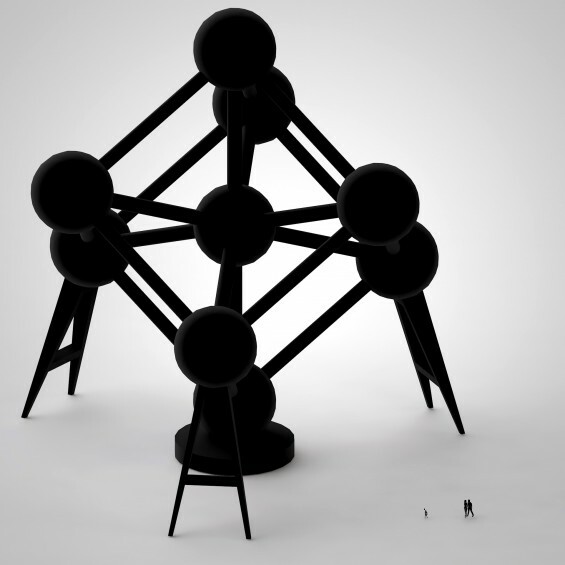 De Wilde is researching how he can develop a blacker-than-black Atomium, questioning the limits of copyright, i.e. reducing the Atomium to a silhouette, a cut-out.